I was just doing my last e-mail check of the night before bed and received my August Staples Teachers Reward Statement. Staples gives teachers 2 percent back on purchases (up to $15 a quarter) with bonus money back during back to school (if you spent more than $200 a quarter - I spent $218 this quarter) and 20% back on copy center purchases (includes copying, printing, laminating and binding - all this communication books!). Also there are rumors that I could not substantiate that Fedex/Kinkos, CopyCat, Target and UPS offer teacher discounts/rewards cards. Local stores frequently offer discounts as well, always ask! Tactile Graphics is a company out of South Africa that produces some beautiful and age appropriate tactile books for pre-school and primary school aged children. They offer eleven educational books, five story books and three nature stories (appropriate for some older elementary). 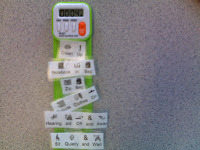 Also available are tactile matching cards which can be appropriate for many ages and a parent/teacher manual. Find the South African Rand to US Dollar Exchange Rate (and other Rand exchanges) here. We are stopping the sale of the Series 4 products – MT4 and DV4 – in most areas on October 1, 2007. However, we will be fully supporting this product for a long time to come. With all of our products – going back to the Dynavox, Dynavox 2C, Dynavox 3100, etc – we supply life-time technical support. We will always answer the phone for any device – forever. What we also strive to do is to be able to repair the devices for as long as possible. At a minimum, we shoot for being able to have the parts to repair a device for 5 years after the given device was actually sold. If we offer repairs for a longer time period, we do. Currently, we are holding the parts in our inventory to do this for the MT4 and DV4. Some of these parts are no longer available from the people who produced them. This is one of the factors leading us to discontinue this product line – to ensure that we have an adequate amount of parts to fully support those with existing products. Other factors are the drop off in volume in preference to the new V and Vmax; and the realization that many of those that are buying what MT4 and DV4 devices are still being sold are doing so without having known to also trial the V or Vmax. Good to know, since I have that Dynavox 2c under my bed! 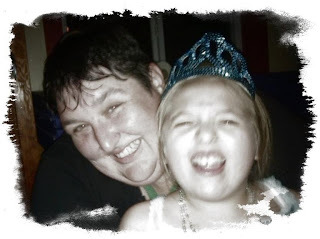 "I just saw this note and, being a Vice President of DynaVox LLC and all, figured I would go ahead and reiterate this statement for this blog. We will certainly continue to support the Series 4 and all its customers with lifetime technical support and a guaranteed 5 years of repairs(from time of purchase)." There you have it. Not only is Dynavox keeping its word about support and repairs, it is also the most responsive bunch of folks around. The Dynavox DV4/MT4 will no longer be sold as of October 1st, 2007. With that news came a rampant rumor in the special education field that Dynavox would discontinue support of the series four devices. I just wanted to post the following from the press release about the discontinuation to ease everyones' minds (including mine). "All Series 4 customers and their care teams will continue to be supported by the augmentative and alternative communication industry’s best technical support team for the life of their product. Additionally, we guarantee repair service will be available for these devices for five years from the date of purchase." I have e-mail the vice president of Dynavox LLC asking him to reiterate this for the audience of this blog and when he responses I will post it. The Dynavox Series Four is an amazing device that was (and really still is) vastly superior to the other devices of its type on the field. That being said, the Dynavox V series surpasses the series four dramatically. Have no doubts that even if the V series is more than the user needs (the only reason to chose the series four over the V) it is a spectacular device. Better more than less! As teachers with tight budgets we have to pick and choose which resources we choose to invest in, especially when the investment is out of our own pockets. During a discuss at a teacher's meeting today we we talking about websites worth the cost and here is a list of some that were mentioned. Feel free to comment to add others. A note before I start, you may want to explore all options before you shell out the cash. See if your district, school or agency has or will buy a site license. Check if the area public library has a subscription. See if there is an internet based public library with a working, paid link. If you end up buying the subscription yourself consider sharing the cost with another teacher or forming a small "website consortium" that buys 3 or 5 computer site licenses and splits the costs. EdHelper has a variety of educational activities in most subject areas K-12. They mostly do not use PDF which means reading and other materials can be cut and pasted into a program like Boardmaker 6.0 or Dynavox Interaact to be "symbolated". They offer daily themes and activities. You can see samples at the site. A limited subscription is $19.95 and a full subscription is $39.95. News-2-You is a symbol based newspaper that can be downloaded and printed weekly along with a communication board, variety of comprehension and related activities. The cost is $140.00 a year, discounts for 5 and then 10 or more subscriptions. *I personally use this website. **I use this website and paid out-of-pocket. Years ago (more than I care to admit) I used battery operated scissors and a battery adapter to have switch operated scissors in my classroom. Then I changed jobs (twice). I've now been a my current job for a while and my population has changed from mostly students working on handwriting or typing to mostly switch users (back where I started all those years ago). These switch scissors are hands down the most preferred adaptive device in my classroom. A few of my students threaten to take them home on a regular basis and I plan to give them as a graduation gift at least once this year. We use our switch scissor for every academic area (all those cut and paste matching activities) and all related areas (art, vocational, life skills, etc.). A favorite activity in our room is scrap-booking and our scissors get plenty of use during that time. This year our room has a different OT and she had never seen switch scissors before; she loved them and before I could blink she was recommending them for all of the other classrooms. If you don't have the $25.00 in your budget, you can hit up some parents to pool resources instead of a holiday gift this December or you can always do it the old fashioned way and use a battery adapter with a pair of battery scissors from the dollar store. 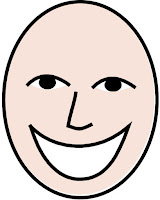 More Social Skills Stories includes "Scott Snot" and "Sneeze Louise"
This site --- look over to the left! Note: Provide accommodations for vision, hearing and motoric challenges as you would for other students with these issues. * “Brown outs” are short (seconds, to minutes or longer) periods of time when the individual with mitochondrial has exhausted energy supplies in their body. They may appear vacant or “out of it” and will most likely be unable to meet demands made of them during a “brown out”. Some “brown outs” can be prevented through energy conservation. “Brown outs” must be distinguished from seizures by a medical team. Sometime Friday night/Saturday Morning my Norton Internet Security quit working, without any notification. Thanks, Norton. My back-up Avast system was not running at full tilter because recently it stopped running if it detected Norton. Thanks, Norton - wait, did I say that already? I woke up Saturday morning to a complete infestation of every possible kind of malware/adware/spyware/virus you can think of. You name it, it was in my laptop. EVERYTHING was in my laptop. It is possible that the ebola virus and the avain flu were in here. I have spent a beautiful weekend, during which I intended on hiking and camping, running a variety of programs to kill off the bugs in my computer and it is still not over. Thus I want to thank the good folks at Castle Cops and Dell Forum for being there for the poor saps like me who's computers are the home for wayward viruses. If you ever have the problems similar to mine this weekend I recommend running Hijack this to get a log of what is running on your computer and comparing to the logs on Castle Cops. If you can't fix it post the log and someone will help. So far I have not needed to post my Hijack This logs. But I have a funny feeling I am headed in that direction. Thank you Castle Cops and Dell Forum! Our current unit for literature/history is on France. I teach in five thematic units a year. I tend to join English and history and do a separate Science unit. The time periods are the start of school to November first, November first to Christmas break, Christmas break to February break, February break to April break, April break to the end of school. This year we will study five countries. 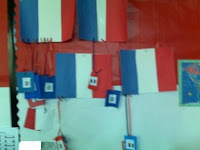 These are some of our France mobiles. The students made the flags and earn a picture symbol ornament to hang from it for each fact they learn. The last symbol they will earn will be the one for Les Miserable after we have finished reading the (adapted) book and seeing the musical. At the end of the unit they will take home a full mobile to hang in their rooms. 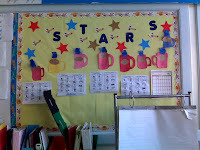 Here is our stars bulletin board where students can choose to have their best work displayed. The objects with the blue tops and handles are mugs and are part of our science unit on matter. They demonstrate the three stages of matter. The mug is a solid, the coffee a liquid and the steam a gas. Below that are some science quizzes and one students spelling score chart. You can also see our flip chart and the students work bins. 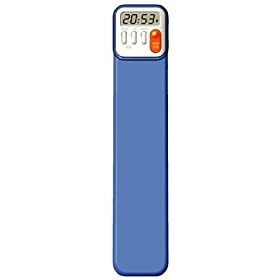 This is the timer I wrote about a few posts ago. Believe it or not the intervention has already been faded! He doesn't need it anymore. Today he looked at the clock at quarter of, put away his belongings, gathered his things, packed his bag, excused himself to use the rest room and was ready to leave early. I wish I had done this sooner. I wonder what else I can use it for? One of my paraprofessionals is going to try using this with her typically developing kindergartener at home. 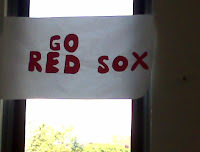 And in honor of the Sox vs. Yankees series this weekend here is the sign the Sports Fan Club in my class made that hangs in our classroom window. As I mentioned the end of last school year Camera Mouse is now available for free from Boston College. All you need is a web cam and you are good to go! It is comparable to similar tracking software that runs hundreds to thousands of dollars. Free software for use with head trackers is also available. Read my previous post for more information. I just uploaded a dozen Boardmaker boards to the TLWMSN group to share. There is a science lab on the properties of matter, a history lesson on the Eiffel Tower and some classroom/behavior management boards. Enjoy. I also had a chance to try out some of the features I mentioned yesterday but hadn't used yet. I particularly liked the drag and drop for dragging pictures right out of a website (had to do that at home, my new school has no internet!!!!!!) and into a worksheet. I also liked the shuffle feature which let me drop the answers for a matching section of a worksheet in order and then mix them up later with out worrying about if I had two letter A answers in a row or whatnot. Later I downloaded all of the addendum PCS symbols (I have purchased them on my own over the years and have 2000-2006 plus the sign language). I ran out of room on my hard drive and decided, without a second thought, to delete that absolutely worthless piece of junk software Overboard (read my review). Everything fit just fine after that. I am really loving the new Boardmaker and I plan to post boards to the TLWMSN group as I make them, I hope everyone else will too. I had my first experience with my new copy of Boardmaker 6.0 today and it was fantastic. I loaded it onto the computer before school and ran out of time. Then in the middle of the day I had a student request to write a (love) letter to another student. I decided to try the new "symbolate" feature of the software, in spite of the fact that I had no idea how it worked. Symbolate allows you to type and have picture symbols appear as you go, like a basic version of Writing With Symbols. Without looking anything up I was able to guess which button turned the feature on and take dictation from my student (he points to symbols - his AAC device is in the shop). I think it is rather remarkable that having only heard of this feature off hand months ago I was able to intuit how to make it work. Way to go Mayer-Johnson! Some of the other features I haven't tried out yet are shuffle (like to mix up those symbols to make Bingo boards), free form button shapes, drag and drop buttons (which lets you drag pictures from other places like Google images into the buttons), align and center and package and share. I can tell it is back to school by the number of new visitors I am getting to my humble blog. Since September first there have been 2,166 visitors. That means nearly nine percent of the sites visitors since it began have been in the past ten days! That is surreal! Over the summer there was an average of about 4,000 hits a month. Should be triple that in September! I especially want to thank those of you who have dropped me an electronic line of gratitude. You're welcome! I considered giving up this blog over the summer; it is consuming about 15-25 hours a week and I was getting tired. However, now I am feeling energized and it feels great to be blogging regularly. I have a student with an IEP objective to get ready to go home independently at the end of the day in under fifteen minutes. He made minimal progress on the objective last year in spite of a variety of interventions. Today I tried something new and he was ready to go in eight minutes. I used a "Mark My Time" bookmark (available at department and bookstores or the website above), print outs of the steps in the routine and velcro to made a timed visual schedule. Then I told him we were having a race and that he had to do all of the steps before for the timer rang to "win". He was asked to remove each step he finished and velcro it to the back of the book mark. The last step was to sit and wait quietly, which he has never done before. He motored like he never has before and then pulled out his chair and sat down saying, "I did it!" I would imagine that this intervention would work with any timed sequence. You can use just text or picture symbols, number of steps you can fit will depend on size of the font or symbol. I think it would be a neat idea for general education teachers to use these as hall passes for students who get distracted and don't come right back to class. My number one tip is not to throw away the directions for the timer! Instead of lamenting on the worst first day of school I have had in 27 years of first days of school (since I was four). I am going to offer you a post copied wholesale from my pal Barrie over at One Switch. 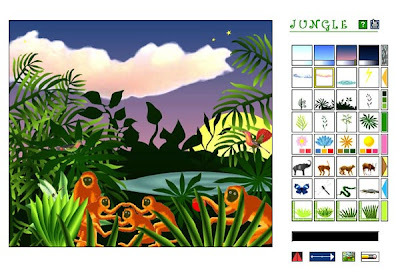 JUNGLE interactive is one of a number of free on-line art activities from NGAkids. These can work well for artists using a single switch with a little help. In fact, there's even an "Auto Jungle" button, which you can click on to create an instant jungle. Good creative fun, if a little slow to load initially. Need a poem? Want to find words to go with your lesson or the art project or that card everyone just made? Need to spice up your English Language Arts lesson? You might want to go to Giggle Poetry. You will find poems, ideas for poetry instruction, animated poems, meet the author, poetry theater and ask the poet. Here is my favorite poem from the back to school section. How to talk like Donald Duck. this is a summary of Les Mis for my class of high schoolers with significant disabilities to pre-learn about the musical before we go see it. Over the years I have taken my student to a variety of theatrical performances. We have seen "The Freedom Train" about the underground railroad and the musical version of "Aida", among others. 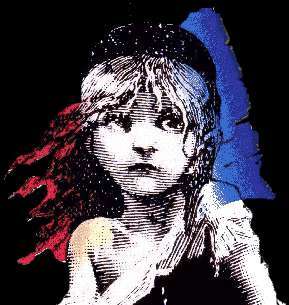 This November we will be seeing Les Miserables. Some of my colleagues have questioned why I do this. Why do I take my high school students, who have significant, multiple disabilities to the theatre? Why such difficult shows? Why don't I take them to one of the quality children's productions? Do they understand the shows? Do they behave themselves? I have so many reasons. First off is the fact that my students have the legal and ethical right to participate in any activity that any other high school student participates in. The theatre is full of high school students when we go, so my students have a right to be there as well. My next reason why I take them is cultural competency. One of the things that holds individuals with disabilities back is lack of exposure to all aspects of culture. We, as their teachers and caregivers, are happy to let them keep listening to N'Sync years after it is out of sync, or worse, Raffi at the age of 18, because we assume that is all they will like and we know it will be a struggle to introduce something new. Having seen Les Mis or having listened to some Broadway soundtracks increases our students exposure to the cultural world. It gives them a new way to connect with others, by communicating about cultural experience. My next reason is that a performance like Aida or Les Miserable gives me an opportunity to create a six to eight week thematic unit that teaches about history, geography, language and sociology of the setting of the performance. I can also weave the topics into reading, math, life skills and even adaptive fitness. Take life skills for example. While preparing to see Les Mis we will talk about hygiene during the early 1800's in France. That will lead to discussions about body odor and dirty clothes. We will take that information and learn how the women of that time and place (and it was mostly women) did laundry. We will try some seventeenth century laundry routines and compare them to doing a load of wash now. We will talk about how much easier it is to do laundry if your body is clean so your clothes aren't as smelly and the importance of using just the right amount of soap. My students may not understand all of it, but they will remember that you need to use soap in the laundry. Thematic units excite me and make my teaching more interesting, this engages my students more completely, this leads to higher comprehension and better retention. Do my students "get" the performances? Maybe not every subtle piece and probably not things like symbolism, but they do get it. The first performance I ever took my high school students to was "The Freedom Train". I pre-taught for seven weeks about Harriet Tubman, the Underground Railroad, slavery and more. My students knew the chronology of Tubman's life. One student had not been paying particularly close attention during some of the lessons, or so I thought, and I wondered what he had retained. As we took our seats in the theatre he turned to me and said, "Harriet Tubman gonna get hit in head?" I was astonished. He had been paying attention. I confirmed this information and he told me, "She a slave. She owned. Master hit her." Correct again. He "got" it. My students still talk, years later, about seeing "Aida". We studied Ancient Egypt for nearly two months before the show, read parts of the play and listened to the soundtrack, but nothing could compare with seeing the performance. The girls all fell in love with the handsome prince and wanted to meet him. The boys, well, they were stunned into silence by the beauty of Aida. The few students who are still in my class now still beg to do more research about Ancient Egypt. They "got" it. As to the behavior issue, my students are invariably the best behaved students in the theatre. We spend weeks learning about theatre behavior. We make charts and signs. We review behavioral guidelines on the way there. We practice "theatre sitting" during various lessons so they are used to it. They understand they must take their seats and stay in them or leave their power chairs turned to off for the performance. They know not to talk or otherwise communicate in ways that distract others from the performance. They never take photographs and have never laughed inappropriately. My students may have some "behavioral issues" but none of them seems any worse than the way that the "typical" high school students act at the theatre. So you see, the my reasons are sound (at least to me), my students do understand and they do behave. Therefore on November 1st we will see Les Mis. To paraphrase Shakespeare, "The play's the thing." I think for educators this weekend is really New Years, so enjoy. It might still be 80 degrees and humid here, but it is time to go back to school! I have spent the week setting up my classroom in a new building (my entire classroom including students, paraprofessionals and about 1/2 of my professional team moved with me). The new building was, well, a dump. It has promise though and I think things will be great (provided I get some chairs in the room by the first day). I have some new ideas I will be trying out and I'm excited about my thematic units. Coming next week I will return to four to five posts a week (time to curb my summer addiction to Second Life). I will have lots of pictures of the new classroom and some of the organization and classroom management ideas I am trying. I will also have more of what people have come to expect in terms of website links, educational products, AT and AAC reviews, and more.